The idea of having a tank which could fly was first seen around in the early 1930s with Walter Christie’s flying M1928 tank, but other designs were made during WW2. The UK (Baynes Bat, 1943), Japan (Special Number 3 Light Tank Ku-R0 with a Kokusai Ku-8 glider, 1944), and the USSR (Antonov A-40, 1942), all attempted to make flying tanks, but none were successful. What each nation wanted was a fairly potent AFV which could fly into battle – something, even on paper, impossible. Having a large enough armament (larger than 12.7mm in caliber), and strong enough armor (at least 20mm) simply meant that the vehicle would be so heavy, that it could not possibly fly. Antonov came up with a very ingenious solution. He added a detachable cradle to a T-60 bearing large wood and fabric biplane wings and a twin tail. The wingspan is estimated to be just over 59 ft (18m) and an overall area of 923.5 ft2 (85.8m2). To put this in perspective as to how large it was, the small fighter aircraft, the Polikarpov I-16’s wingspan was 29 ft 6 in (9m), with an overall area of 156.1 ft² (14.5 m²) – the A-40’s wingspan was nearly double, and the overall area was nearly six times greater (although the A-40 cradle was dual-winged)! The idea was for the A-40 to drop the cradle once deployed onto the battlefield – and this was necessary, for obvious reasons. No tank could possibly be deployed effectively in combat with near 60 foot wings sticking out of it. 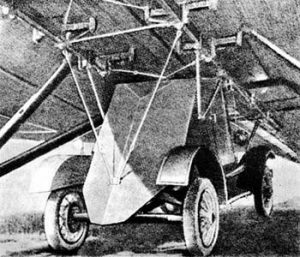 The wings would not only make the vehicle slower due to their weight, but they would create quite a lot of drag. One T-60 placed into a glider in 1942, intended to be towed by a Petlyakov Pe-8 or a Tupolev TB-3. The tank was lightened for air use by removing its armament, ammunition and headlights, and leaving a very limited amount of fuel (and, according to some sources, its turret was also removed). According to the official story (which is dubious), there was a test flight on September 2, 1942. Even with the modifications, the A-40 was too heavy to be towed. A TB-3 bomber was towing it, but it had to ditch the glider to avoid crashing. The drag was simply too much, and the bomber could not handle the weight of its payload. 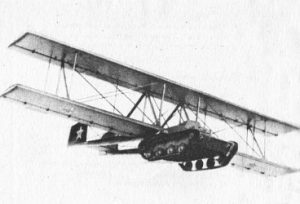 The A-40 was piloted by the famous Soviet experimental glider pilot Sergei Anokhin, and, once ditched, it supposedly glided smoothly. The T-60 landed in a field near the airdrome it was being tested at, and after dropping the glider cradle, it was driven back to the base. There was no aircraft which could handle the weight of the vehicle, and therefore tow the A-40 at the correct speed (160km/h), and, for that reason, the project was abandoned. The first major problem with the Antonov A-40 is that it had huge wings. These would have to be ditched before combat, which would surely delay its combat deployment (although probably not nearly as much as dropping the crew separately). Secondly, if the vehicles were to only have limited fuel and no munitions, in order to be light enough to be dropped, then munitions and fuel would have to be dropped separately, thus meaning that the combat deployment is, yet again, delayed, because crews would have to scramble to get munitions and fuel loaded into the tank – and there is no guarantee that wind would not glide these airdrops away from their intended users. Thirdly, the T-60 itself was not a particularly potent tank – not even in 1942. Its 20mm TNSh gun would only be viable for engaging lightly armored, or unarmored targets, and its armor, 20mm at best, could hardly withstand even the lightest of German AT guns. Fourthly, it is unclear as to whether or not the vehicle was even successful. The official story, as recorded above, might be a gross exaggeration, or a total fantasy. The purported photo of the A-40 in flight is actually a drawing produced by the Antonov factory. Rendition of the Antonov A-40. The colors are speculative, and it may be the case that some bare wood or tarp is showing. A drawing (or perhaps a photograph of a model), of the A-40 in flight. 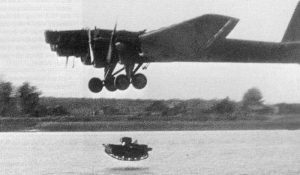 This image was produced by the Antonov factory and is not, as some claim, a photograph of the real prototype. The T-60 appears to be an M1942 GAZ production, as shown by the stamped wheels. A T-37 tank being dropped by a TB-3 bomber. It is incredibly low to the ground, which would make serious combat deployment dangerous, due to enemy fire. It’ll be moved to a new article soon. Ah…. the TB-3, Used to carry many things from tanks to planes. *what where thoses ruskys thinking! * Also, note the bicycle landing gear….